- J. R. R. Tolkien, The Fellowship of the Ring. The 20th Conference of the International Federation of Operational Research Societies (IFORS 2014) Barcelona, Spain, July 13 - 18, 2014. Session title: "Nonconvex nonsmooth optimization methods". The 24th European Conference on Operational Research (EURO XXIV), Lisbon, Portugal, July 11 - 14, 2010. Session title: "Numerical methods for nonsmooth optimization". The South Pacific Continuous Optimization Meeting (SPCOM) 2015, Adelaide, Australia, February 8 - 12, 2015. Presentation (invited by organizers of SPCOM 2015): "Diagonal Bundle Method for Sparse Nonconvex Nonsmooth Problems". The 21st International Conference on Multiple Criteria Decision Making (MCDM), Jyväskylä, Finland, June 13 - 17, 2011. Presentation (in invited session organized by Prof. Marko Mäkelä): "Necessary and Sufficient Optimality Conditions for Generalized Convex Nonsmooth Multiobjective Optimization". SIAM Conference on Optimization 2011, Darmstadt, Germany, May 15 - 19, 2011. Presentation (in invited session organized by Prof. Antonio Frangioni): "Limited Memory Discrete Gradient Bundle Method for Derivative Free Nonsmooth Optimization". Federal University of Rio de Janeiro (UFRJ), Brazil, August 7, 2009. 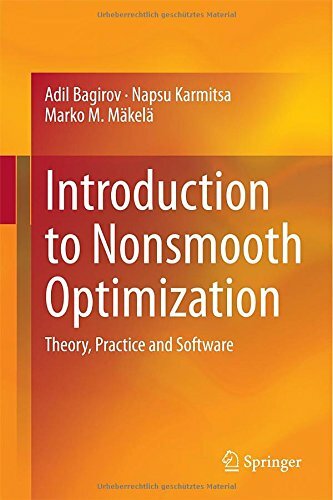 Lecture: "Introduction to Nonsmooth Optimization". University of Kuopio, Department of Physics, April 16, 2008. Lecture: "Suurten optimointitehtävien numeerinen ratkaiseminen ja epäsileä optimointi" (Numerical methods for Large-Scale and Nonsmooth Optimization). The 22nd European Conference on Operational Research (EURO XXII), Prague, The Czech Republic, July 8 - 11, 2007. Presentation (in invited session organized by Prof. Claudia Sagastizábal): "Limited Memory Interior Point Bundle Method". Federation University Australia, Faculty of Science and Technology with Prof. Adil Bagirov as a host. Ballarat, Australia, January 2 - December 28, 2016, February 13 - 27, 2015. Universita Della Calabria with Prof. Manlio Gaudioso as a host. Rende, Italy. November 1 - 8, 2015. University of Ballarat, Centre for Informatics and Applied Optimization, School of Information Technology and Mathematical Sciences with Prof. Adil Bagirov as a host. Ballarat, Australia, February 8 - 20, 2011. Federal University of Rio de Janeiro (UFRJ) in the Mecanical Engineering Program — COPPE with Prof. José Herskovits as a host. Rio de Janeiro, Brazil, June 6 - 18, 2008 and August 1 - 15, 2009. University of the Witwatersrand, School of Computational and Applied Mathematics with Prof. Montaz M. Ali as a host. Johannesburg, South Africa, November 4, 2005 - November 3, 2006. The Fifth International Conference on Continuous Optimization (ICCOPT2016). Tokyo, Japan August 6-11, 2016. Poster: " New DC diagonal bundle method for clustering in large data sets". The 10th International Conference on Optimization: Techniques and Applications (ICOTA 10). Ulaanbaatar, Mongolia July 23-26, 2016. Presentation: " New DC diagonal bundle method for clustering in large data sets". The 20th Conference of the International Federation of Operational Research Societies (IFORS 2014) Barcelona, Spain, July 13 - 18, 2014. Presentation: "Diagonal Bundle Method for Sparse Nonsmooth Optimization". The 24th European Conference on Operational Research (EURO XXIV), Lisbon, Portugal, July 11 - 14, 2010. Presentation: "Comparing Nonsmooth Optimization Methods and Software". The 8th EUROPT Workshop: Advances in Continuous Optimization, Aveiro, Portugal, July 8 - 9, 2010. The 24th IFIP TC 7 Conference on System Modelling and Optimization (IFIP 2009), Buenos Aires, Argentina, July 27 - 31, 2009. Presentation: "Comparing Nonsmooth Optimization Methods and Software". International Conference on Engineering Optimization (EngOpt 2008), Rio de Janeiro, Brazil, June 1 - 5, 2008. Presentation: "Globally Convergent Limited Memory Bundle Method for Bound Constrained Large-Scale Nonsmooth Optimization". The 22nd European Conference on Operational Research (EURO XXII), Prague, The Czech Republic, July 8 - 11, 2007. Presentation (in invided session organized by Prof. Claudia Sagastizábal): "Limited Memory Interior Point Bundle Method". The 19th International Symposium on Mathematical Programming (ISMP 2006), UFRJ, Rio de Janeiro, Brazil, July 30 - August 4, 2006. Presentation: "Limited Memory Bundle Method for Bound Constrained Large-Scale Nonsmooth Optimization". The third Mathematics in Industry Study Group in South Africa (MISGSA 2006), the University of the Witwatersrand, Johannesburg, South Africa, January 23 - 27, 2006. The Eighth SIAM Conference on Optimization, Stockholm, Sweden, May 15 - 18, 2005. The 40th Workshop Large Scale Nonlinear Optimization, Erice, Sicily, Italy, June 22 - July 1, 2004. Presentation: "Large-Scale Nonsmooth Optimization: Limited Memory Bundle Method"
The 18th International Symposium on Mathematical Programming (ISMP 2003), Copenhagen, Denmark, August 18 - 22, 2003. Presentation: "Large-Scale Nonsmooth Optimization: New Limited Memory Bundle Method". Finnish-Russian Doctoral Seminar on Multicriteria Decision Aid and Optimization, Helsinki, Finland, November 28 - 29, 2002. Presentation: "Bundle Methods for Large-Scale Optimization". Teaching Role workshop, Centre for Learning, Teaching and Development (CLTD), University of the Witwatersrand, Johannesburg, South Africa, June 12 - 14, 2006.